"There is something about road trips that is uniquely American. It's in our blood. Our national history is one of discovery. Our heritage is written of exploration. We have itchy feet." Itchy feet, indeed. Jim and I have trouble staying in one place for very long. There's just so much to see and do in this wide, wonderful land of ours! 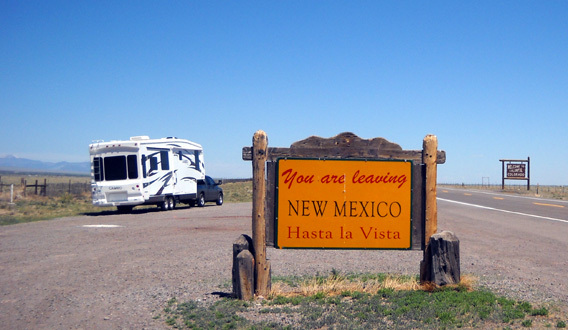 In this entry I'll wrap up some loose ends about our week in Los Alamos, NM, describe our trip north to Colorado Springs today, and tell you about our plans in that area over the next week and a half. Then it's on to another campground for another race just west of Denver. We did a lot more exploring in and around Los Alamos last year, visiting intriguing places like Bandelier National Monument, the Tsankawi cliff dwellings, the nearby town of White Rock, the Valles Caldera National Preserve, Jemez Springs, the Bradford Science Museum, and other historical places in Los Alamos. I wrote all about those adventures in the 2009 journal. This year we were lazier. It was too soon to return to some of those places. It's more exciting the first time, or at least the first time in a long while (we'd been to Bandelier before, but the other places were new to us). We were so lazy this past week that we didn't even eat out at the local restaurants we enjoyed last year. We both needed more rest. We listened to our bodies and took it easy. That doesn't mean we sat in our camper all day, every day. We still got plenty of exercise and found ways to amuse ourselves. I hesitate to use the word "camping" to describe what we did in our Cameo in Los Alamos the past week. "Parking" is more appropriate. 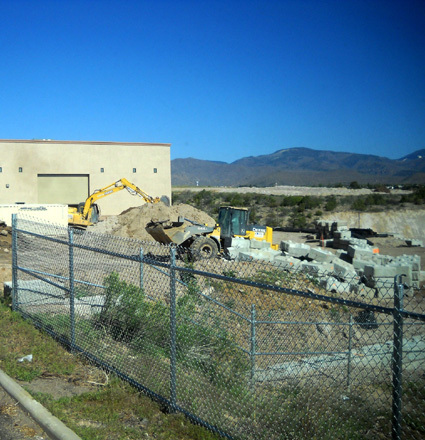 Life was even more interesting this year at the city's RV park on NM 502 at the eastern edge of town than it was last year, when the large city/county maintenance facility was being built right below us in Pueblo Canyon. That spot was great our first two days on the weekend when hardly anyone else was using the parking area. It was also OK Monday to Friday during the morning and overnight (even the construction work was quieter than rush hour traffic on Hwy. 502) but it became very busy with restaurant traffic at lunch and dinner on the weekdays. Several other campers were in and out during the five days we stayed there. I numbered them 1-5 in the photo above. We're #3. 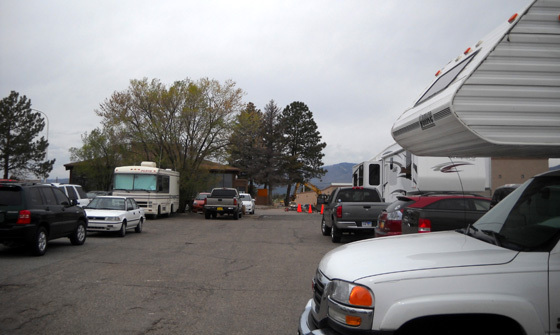 This really is an RV camping area but you wouldn't guess that from these pictures. Restaurant patrons are forced to park there, too. For some reason, the restaurant has only about six parking spaces (same thing last year, and there wasn't adjacent construction then.) Employees park across the busy highway. 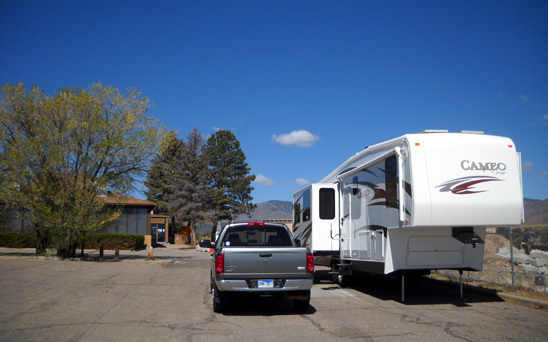 Patrons who value their lives use the RV parking area so they don't have to cross the road. We were amazed how many vehicles wedged themselves into that parking area! We don't remember the restaurant being near that busy last year. On the cloudy day I took these photos, over thirty cars and trucks found places to park there. I imagine some were mumbling about all the campers in their way! 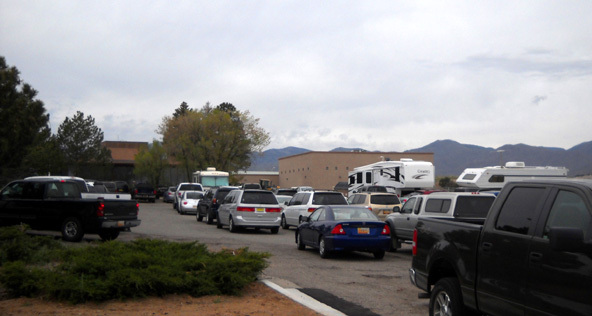 Fortunately, no one bothered us or blocked us in when we wanted to leave in our truck (background right in photo above). Here's a picture my brother will like. 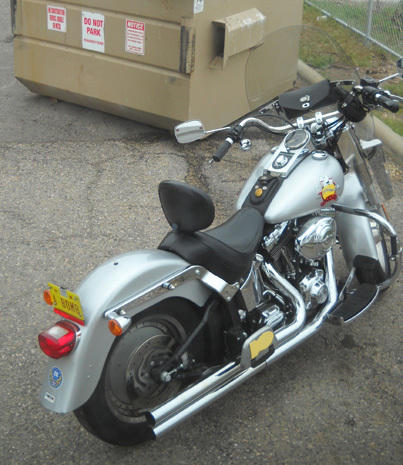 One day a handsome motorcycle parked between us and the trash bin behind our camper. We noticed its license tag right away, as did several restaurant patrons who stopped to admire the bike and comment on the tag, which reads "A BOMB." How's that for a double entendre in the city where the atomic bomb was developed?? I don't know if the owner works at the National Lab and/or thinks his bike is "da bomb." 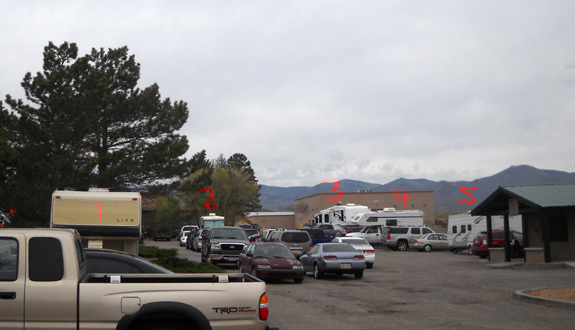 We were more than happy Friday morning to move one mesa north to the parking area near the Posse Shack for the Jemez races. I don't now if it's city, county, or private property but race entrants are allowed to use it on the weekend and we appreciate being able to park there for two nights. Ah . . . that's much better, more like a real campground. (No, the limbs weren't touching the camper, even in the wind.) We never left Cody outside at the other place but this was great for him. Of course, he'd rather be inside with us when we're home than outside alone, even at the most perfect campsite. He's not a house dog; he just wants to be close to us, no matter where we are. Although we were again surrounded by vehicles during the race, it was very quiet (and dark) both Friday and Saturday nights. Free, too! There isn't any water or a dump station here. We dumped our gray and black water at the RV park on Hwy. 502 before we left that location and put enough fresh water in the tank for several days. We used our generator and solar panels for power in both locations because neither has electrical hookups. On Sunday morning we walked over to Marcy and John Beard's nearby camper and shared war stories about the Jemez race. 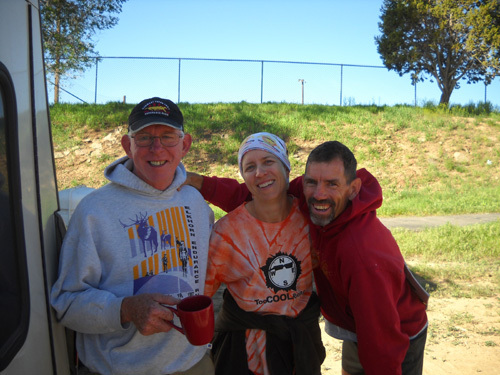 John (below, right) blitzed the 50K and Marcy stormed the 50-miler. 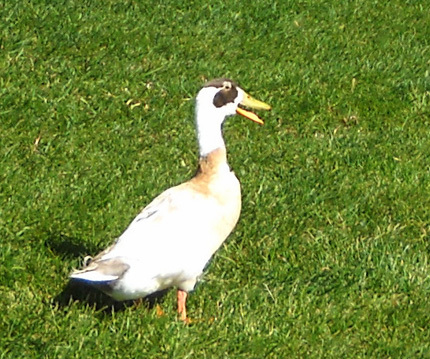 We'll get to see them again in July when they're acclimating in the Silverton, CO area for Hardrock. 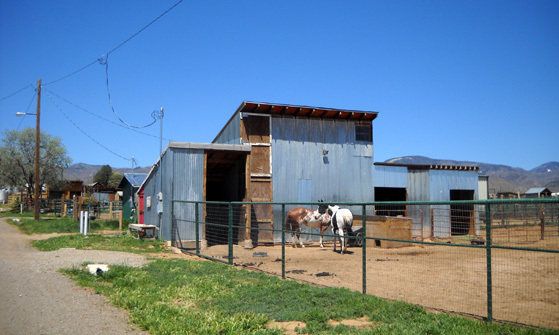 Part of the fun of camping out near the Posse Shack and using the trails on the adjacent Kwage Mesa is traipsing through the "streets" of the North Mesa Stables. 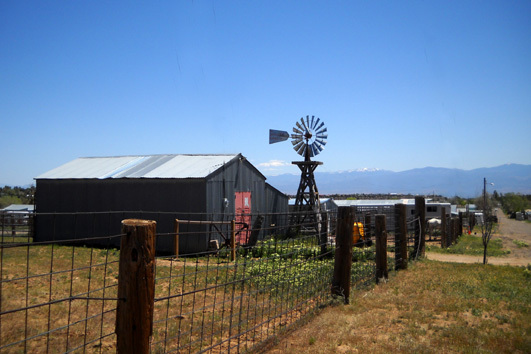 There are dozens of little plots of land with barns, horses, chickens, roosters, and other critters. The variety of structures is interesting. The day I took these pictures several owners were out feeding their stock, shoeing horses, and doing other chores on their mini-ranches. 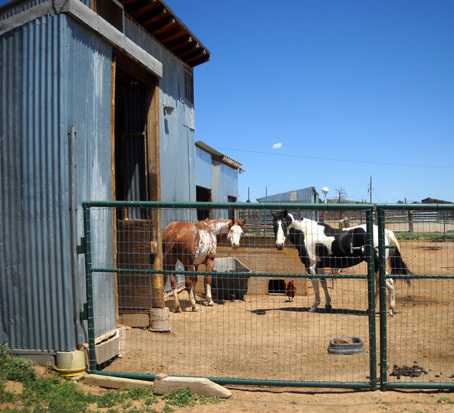 What a great alternative for urban dwellers who want horses but not the expense of several acres of pasture. The farm girl in me always enjoys a trek through the stables! Cody likes rubbing noses with the horses, too. On Thursday I was taking a short walk in the Ashley Pond area downtown while Jim was doing laundry near the science museum. 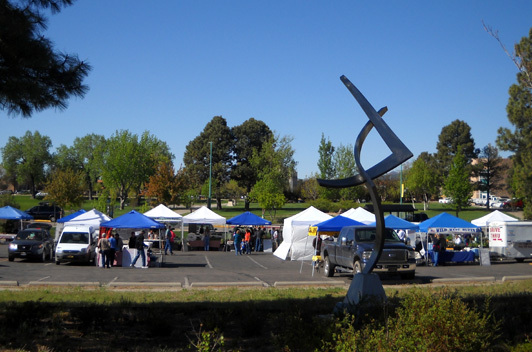 I spotted some tents and canopies in a parking area across Trinity Street and discovered the weekly Los Alamos Farmers' Market. Good! I missed it last year because it's only held on Thursdays during the growing season. 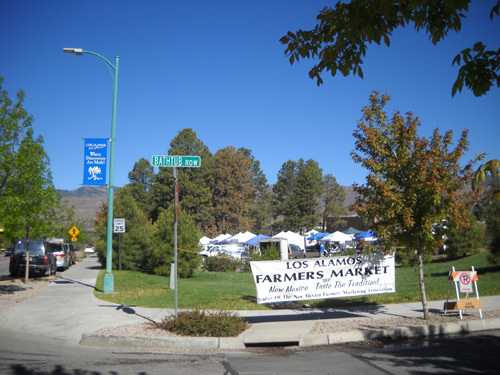 Although I didn't buy anything I enjoyed seeing the tempting homegrown or home-prepared products for sale -- things like goat cheese, honey, jams and jellies, buffalo jerky, bread and other baked goods, Southwestern seasonings, herbs, fresh vegetables, flowers, and other items. 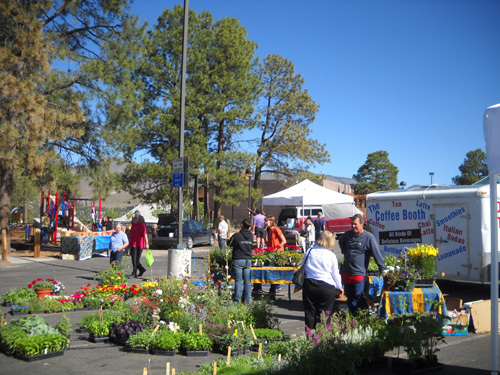 About twenty local vendors offered their products for sale. I walked through the adjacent city library complex, admiring the attractive water fountains and landscaping, then headed toward Bathtub Row. I wrote about the historical significance of the houses along Bathtub Row in one of my entries last year. I paused before crossing the quiet residential street for a woman on a bicycle. We both realized at the same time that we knew each other -- it was ultra runner Charlie Thorn's wife, Andi Crohn (sp?). Charlie used to work at the National Lab in Los Alamos; I believe he has retired and does contract work there now. Andi and Charlie still live in the area and also have a house in Silverton, CO. We'll get to see them again at Hardrock in July. Both are very active with that race. 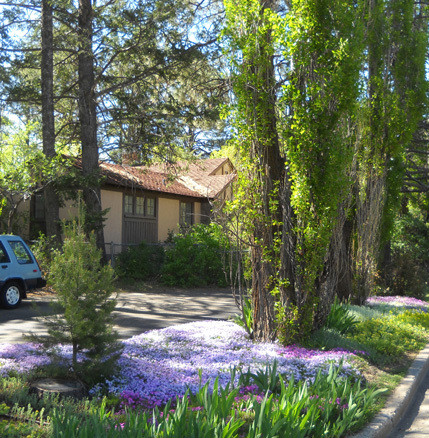 I think the second house is the one that used to belong to J. Robert Oppenheimer, Director of the Manhattan Project in the 1940s. Before I had time to visit the 1200s-era Pueblo dwelling foundation or historical museum again, Jim called to say he was done with the laundry. That's OK. I remember those from last year. Many of our plans for this trip are fluid. Jim isn't sure exactly which races he wants to run or work and there are some gaps between dates certain that we haven't completely filled in yet. That's OK with me; I like making it up as we go! About ten days ago Jim came up with a great idea to fill the gap between the Jemez race and his next race a little west of Denver. 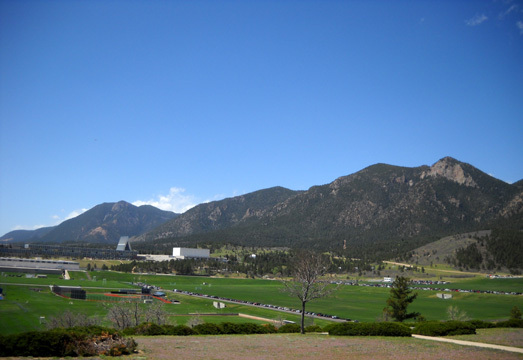 Why don't we stay at the US Air Force Academy in Colorado Springs? 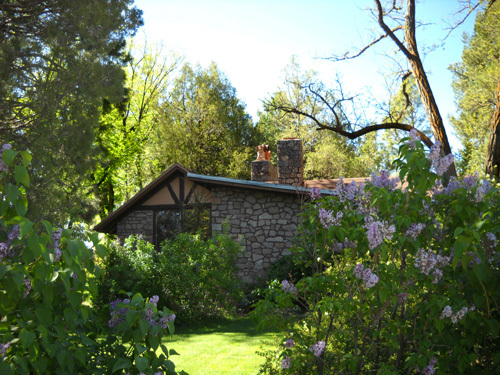 They have a "Fam Camp" (family campground) that is available to current and retired military personnel and their families. 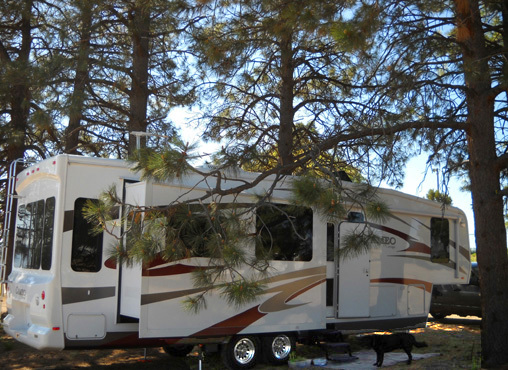 We haven't camped there before but the description sounded nice and it's convenient for many activities in the area. 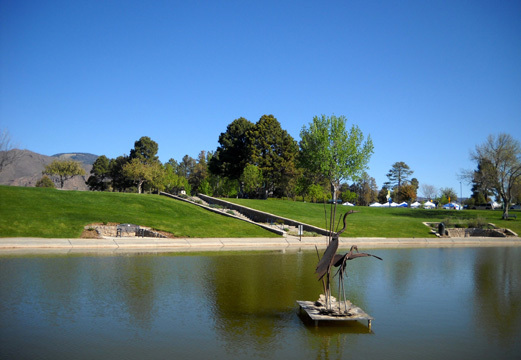 Both of us have had several enjoyable visits to Colorado Springs over the years. We haven't been there for a good while, however, so I was definitely game to go for a week and a half if we could get reservations. What we didn't know until Jim called the Fam Camp was that 1,001 cadets would be graduating this Wednesday! That's a huge deal, just like a West Point graduation ceremony. We were extremely lucky to get the last campsite that is large enough for the Cameo. We're not so lucky with graduation tickets; extras for the public are sold out. We weren't sure which of three routes we'd be taking to Colorado Springs until we left the parking area near the Posse Shack in Los Alamos this morning. Talk about flying by the seat of your pants! Last year we went through Colorado Springs on I-25 when we left Los Alamos and headed for northern Wyoming for the Bighorn Mountains. 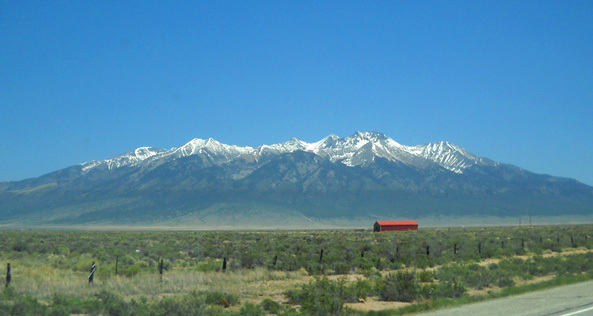 We liked the scenic drive we chose then on Routes 68 and 64 through the Taos area and over the Sangre de Christo Range, intersecting with I-25 just below the Colorado border. That route was fairly slow, however, with lots of narrow mountain miles. A second option was backtracking to Santa Fe to catch I-25 there. Although longer, it would be faster with more freeway miles. I lobbied for a third route that would be new to both of us: heading north on US 285 along the Old Spanish National Historic Trail to Alamosa, CO, then turning east on US 160 to intersect with I-25 at Walsenberg. We'd be topping out over 9,400 feet when we crossed the Sangre de Christo Mountains that way, too, but driving through fewer towns that would slow us down. Better yet, it was a new route to both of us -- that's what convinced us to go that way! "Our heritage is written of exploration," and all that. Even with three stops, we reached Colorado Springs a little faster than we did last year and we enjoyed it even more. Here's a synopsis of our route for others who are curious about traveling this way, particularly with an RV. 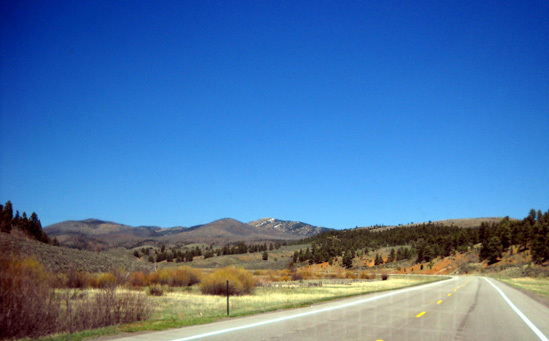 We drove east on NM 502 to NM 30 going north, which we knew from last year's trip was a smooth, fast road. We quickly dropped from 7,300 feet in Los Alamos to 5,700 feet in Espanola, most of it in the first few miles on NM 502. The descent is not killer if you shift into a lower gear, use a tow/haul transmission setting, and/or use engine brakes. 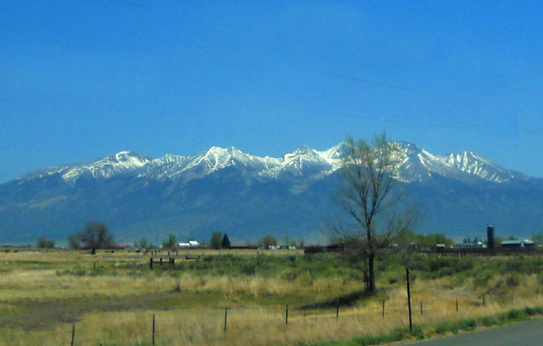 There is still lots of snow on the peaks of the 12-13,000+ foot mountains, making this a scenic drive in May. We passed several elk and cattle crossing signs but saw only cattle. We gradually climbed up to 7,800 feet by Tres Piedras, NM and reached 8,500 feet on the eastern flank of San Antonio Mountain. 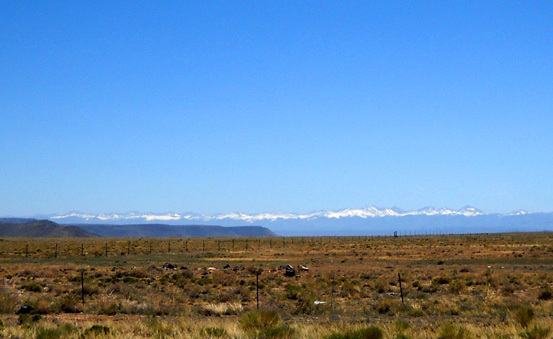 We enjoyed lunch at a pull-off at the NM/CO border, where we began having great views of Blanca Peak, a Colorado 14er we could see for many miles. The brown sign on the right says, "Welcome to Colorful Colorado!" 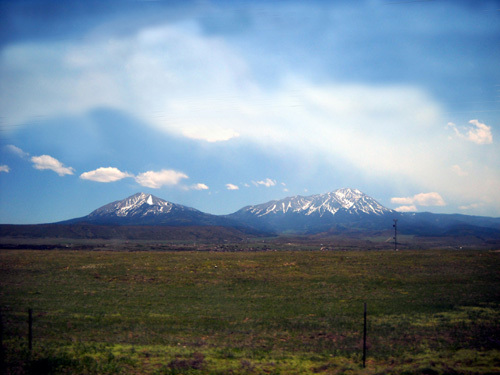 US 285 was even smoother and prettier in Colorado as we dropped down to 7,587 feet in Alamosa. That's where we headed east on US 160 for about 74 miles to I-25. US 160 (below) was more hilly and curvy than US 285 but it's still a great road. We passed a road leading to the Great Sand Dunes National Park and Preserve, which we had considered visiting before we made reservations in Colorado Springs. We'll save it for another time, maybe one of those "gaps" we have later in the summer. The next five pictures along US 160 are "windshield shots" (taken in our moving truck while Jim was driving) that aren't perfect but came out well enough to post. We ran into a little more traffic on US 160, probably because it's closer to the freeway, but there are plenty of opportunities for faster vehicles to pass slower ones. This road is very scenic as it approaches 14,345-foot Blanca Peak (next two photos) from the west and curves around the mountain on the south. I imagine the views are just as nice going west. They are so close together that I didn't realize until we were going down the eastern side that we'd gone over two passes! 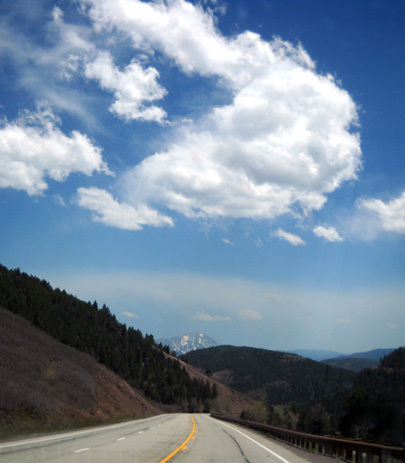 There are numerous scenic highways in Colorful Colorado that aren't marked as such. It's my guess that there are simply too many stunning roads in the state to mark them all as such! We really liked this route over to I-25, which we followed for another 98 miles to our destination at the USAFA. Compared to last year's route, US 285 and 160 were faster, straighter, and smoother, had fewer towns and easier climbs and descents, and were more relaxed to drive. 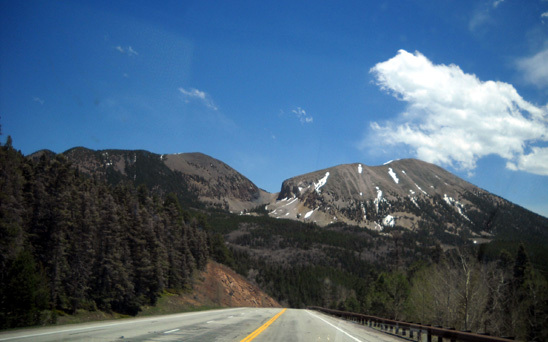 We entered the Academy at exit 150 to the south gate, passed through security quickly, and immediately fell in love with the huge, attractive base at the foot of the Rockies -- not just the Rockies, but Pike's Peak, too, one of my very favorite 14ers. This is gonna be a great week and a half, revisiting old haunts and discovering new ones! 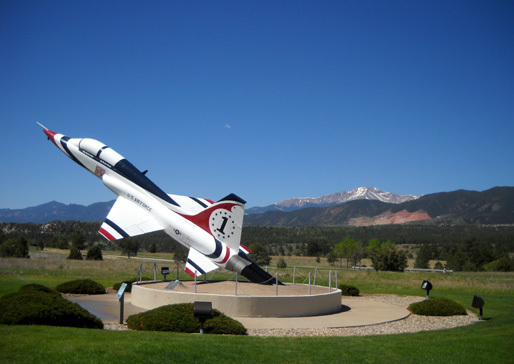 We'll share photos and stories about the USAF Academy, cadet graduation, and Thunderbird air show; the trails we run and hike; scenic drives on Pike's Peak, other local mountains, and through the Lost Creek Wilderness Area; a tour of the US Olympic Training Center; rock features in Garden of the Gods and Red Rocks Park; the annual Territory Days Festival; a special Memorial Day commemoration of those who have died in service to our country; and other topics. I doubt we'll get through the whole list of things I'd like to do and see here. That means we'll have to come back!